Iowa farmer David Sieck gives us a tour of the antique tractors at the Craft Show. We spend the afternoon riding around the farm on Sieck’s golf cart as people hustle to prepare for the biggest day of the Craft Show. Corn fields surround the old barns at the site. There are dozens of antique tractors on display, and a raffle for a new one. A plot of U-pick potatoes is ready for the kids. 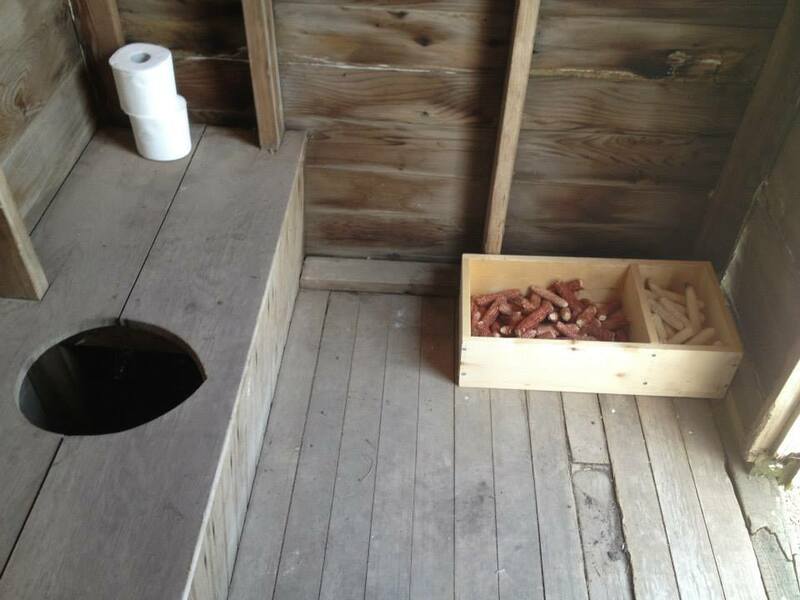 In the bathroom, corncobs serve as a possible substitute for toilet paper. 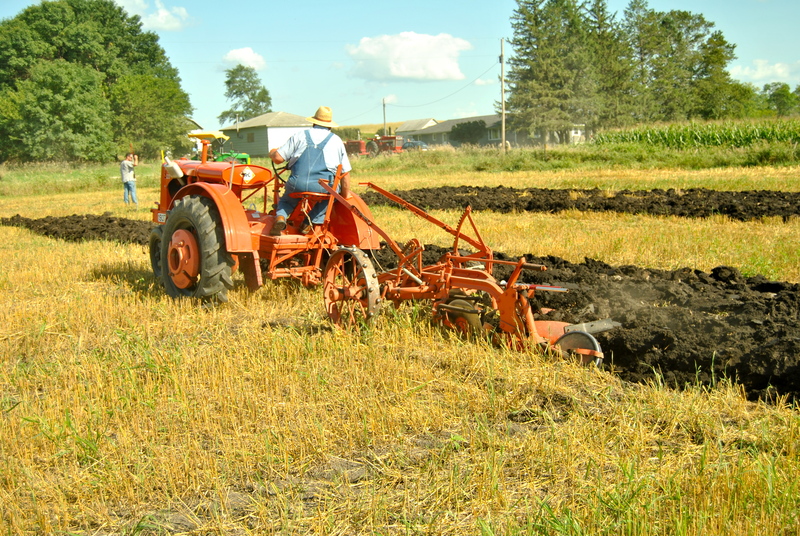 The whole event is a tribute to old-timey farming culture and community in Iowa. But overlaying the constancy of tradition is the sense of rapid ecological and technological change. In 2012, the majority of the U.S. saw the harshest drought since the Dust Bowl of the 1930s, with temperatures surpassing the most recent extreme drought of 1988. The 2012 drought was especially harsh in the Midwest, with all of Iowa and nearly all of Nebraska experiencing ‘extreme’ or ‘severe’ conditions by August. Many farmers’ cornfields shriveled, producing small to non-existent yields. 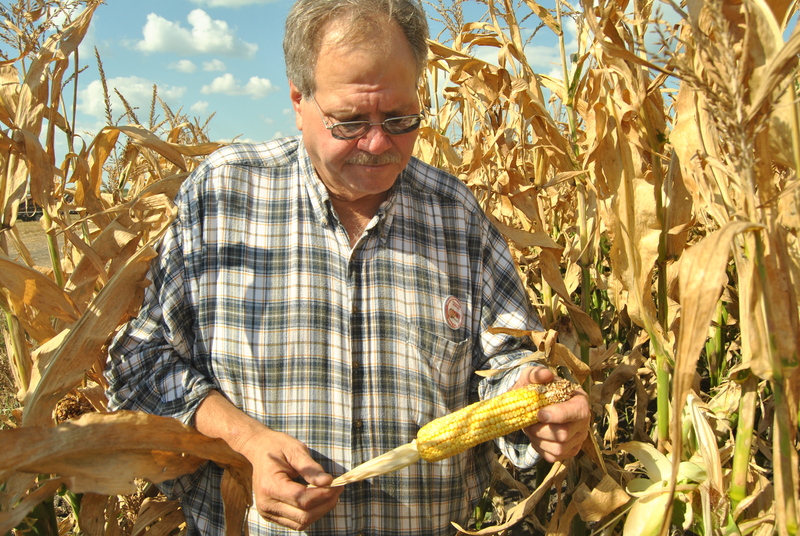 Iowa corn grower David Sieck shows us corn at the ‘milky’ stage of development. 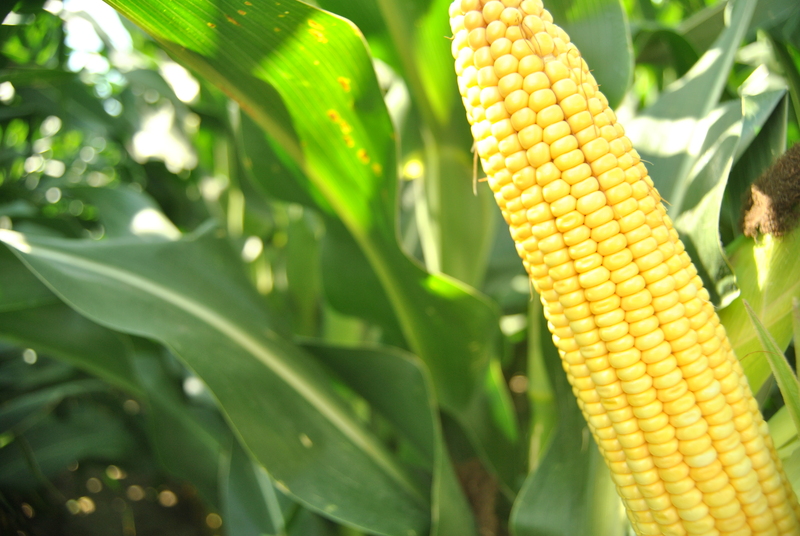 Monsanto and DuPont Pioneer released new drought-tolerant corn seeds. Coincidentally, the mega-drought year also saw the launch year of two new drought-tolerant seed products. 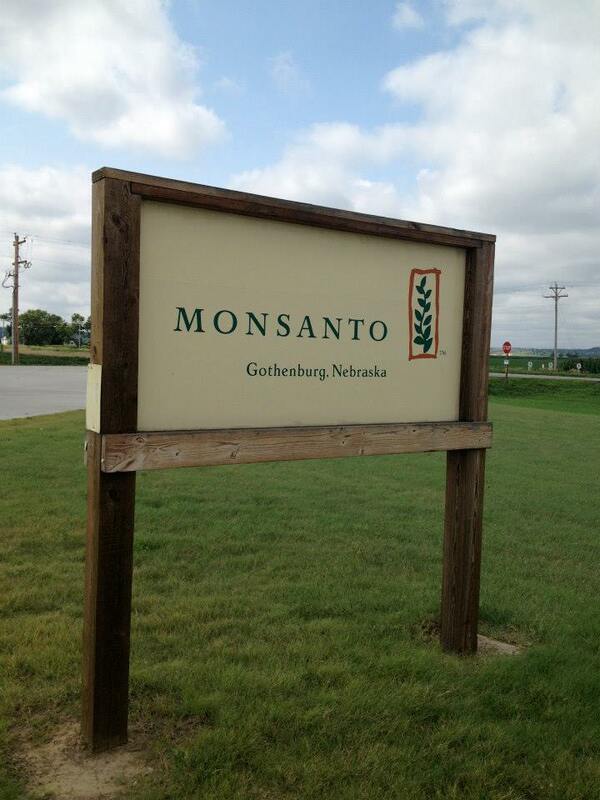 Monsanto released a seed line called Genuity DroughtGard Hybrids and DuPont Pioneer launched its Optimum AQUAmax line. Both products are the result of years of research and development among top scientists in the companies’ labs. Both are intended to produce high quality corn on less water. So the (many) million dollar question that seed companies, farmers, and eaters alike seem to be asking is: Will these new ‘Super Corns’ save the Corn Belt? The question is all the more urgent when climate change is added to the equation. 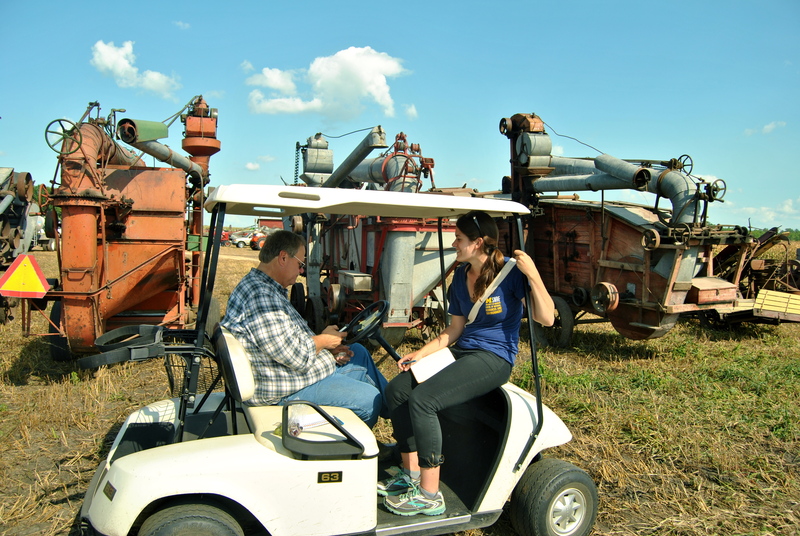 We visited the National Drought Mitigation Center based out of the University of Nebraska-Lincoln, where Dr. Michael Hayes and his staff run the U.S. Drought Monitor that collects localized drought data from farms around the country. 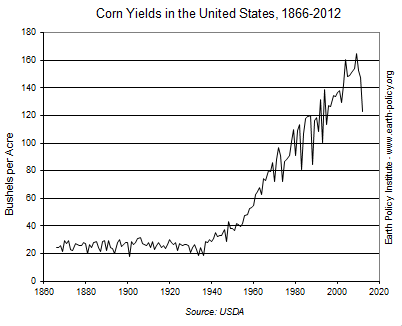 “2012 was the largest departure from the curve of corn production ever,” said Hayes. ‘The curve’ shows that corn production had been growing steadily since the mid-1930s as technology improved and farmers expanded the crop to more acres. 2012 is an obvious departure from that trend: At an average 123 bushels per acre, U.S. farmers had not seen such low yields since 1995. Nebraska and Iowa are actually in the midst of a multiple-year drought. A NOAA Drought Task Force did not find a significant connection between climate change and the 2012 drought, but changes in the Corn Belt climate are putting additional pressure on water availability and corn yields, affecting farmers’ abilities to react in those dry drought years. Some scientists predict that, with climate change, droughts will grow longer and more severe, and precipitation will become less predictable. Tapan Pathak, who acts as a liaison between climate researchers and the Agricultural Extension officers at the University of Nebraska-Lincoln, says that climate change is already impacting how farmers use water. In the last 100 years, precipitation has actually risen two to three percent in Nebraska. However, Pathak explains, “even though we have seen increased precipitation, it doesn’t mean more water is available for farmers. We’re seeing more one-day extreme rain events.” These intense rain bursts cause the water to run off into drainage systems and down streams rather than sinking into the soil to nourish the corn or recharge the aquifers. 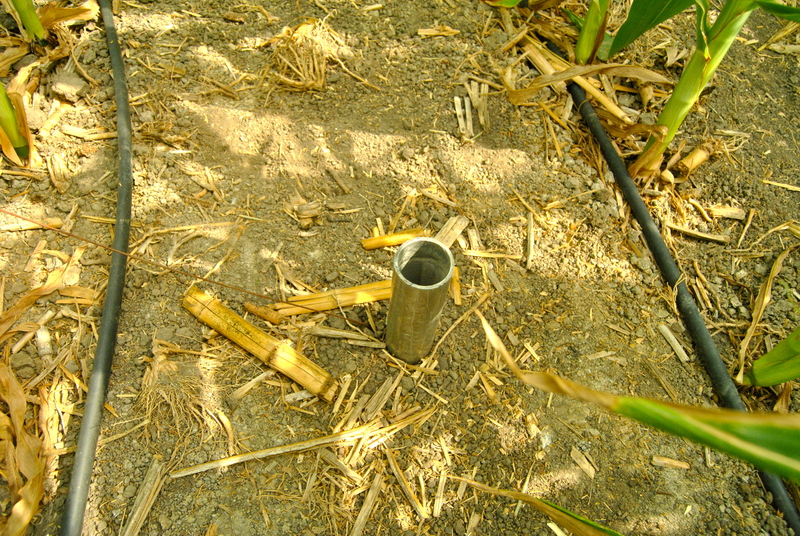 A monitoring device measures soil moisture in a corn field. Pathak says farmers are also noticing warmer temperatures at night, which can have major implications for crop yields: “When nighttime temperatures are high, the corn plant adds a respiration process that limits growth,” Pathak said. In other words, warmer nights cause the plants to use energy for keeping cool that they would otherwise use for growing. Warmer nighttime temperatures can also increase the rate at which water evaporates from the soil, leading to more irrigation. While irrigation saved many Nebraska farmers in 2012, it’s not a strategy they can rely on indefinitely. In the Cornhusker state, which ranked third in U.S. corn production in 2010, over half of crop and pastureland (mostly to the East) is irrigated, with over 90 percent of that irrigation sourced from groundwater—the High Plains Aquifer System which encompasses the Ogallala Aquifer. Even in non-drought years, the Ogallala, which provides water to farmers in seven states, is being drawn down faster than it can recharge. Tonya Haigh, a research specialist at the National Drought Mitigation Center who develops drought monitoring plans with farmers and ranchers, sees the writing on the wall. “Irrigation got them through last year and could probably get them through another year, but it’s not a safety net forever,” she said. So it’s no wonder that the drought, the stress on underground water reserves, and the fear that climate change could make it worse caused the corn industry to pay close attention when DuPont Pioneer and Monsanto released AQUAmax and DroughtGard, respectively. “After the 2012 drought, farmers are getting more and more interested in drought-tolerant varieties,” Pathak told us. DuPont Pioneer, the largest producer of hybrid seeds for agriculture, has been working on drought tolerant corn for over 50 years. Their new line of seed, Pioneer brand Optimum AQUAmax hybrids, produce corn designed to survive stress in water limited environments: its root system is highly efficient, its kernels are deep, and the stomata on its leaves release minimal water when the plant respires. AQUAmax corn grown at the DuPont Pioneer Innovation Center in Johnston, Iowa. 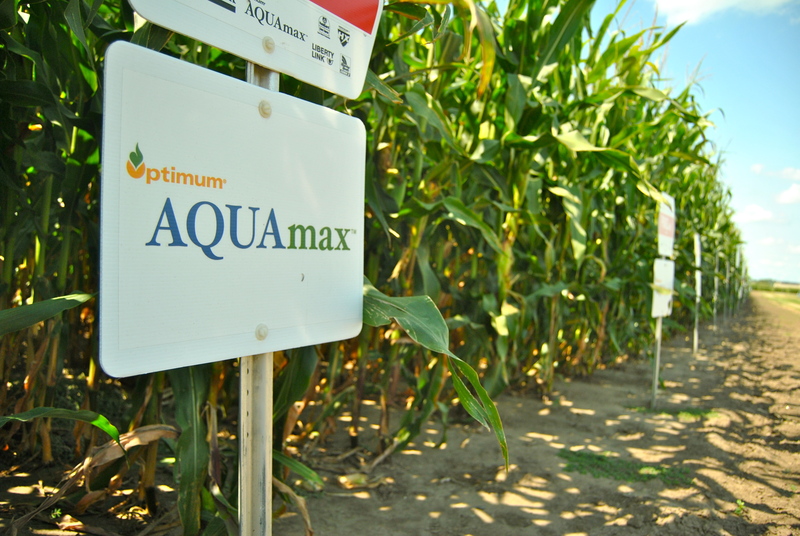 After a limited launch in 2011, AQUAmax corn is now grown on seven million acres across the United States. In DuPont Pioneer’s field tests, which consisted of 11,000 side-by-side comparisons of corn varieties, AQUAmax yields were 8.9 percent greater than the next best commercially available variety of corn in drought conditions. Even when the testers provided the corn with plenty of water, AQUAmax outperformed other varieties by 1.9 percent. Dan Hansen of DuPont Pioneer tells Allie about research projects at the Innovation Center. We visited the company’s Innovation Center in Johnston, Iowa to find out how DuPont Pioneer created this alleged “Super Corn.” The Innovation Center employs approximately 3,000 people—including researchers and agronomists—and includes 600 acres where crop varieties are tested and compared in open air However, before this comparison of phenotypes—the visible traits that the corn displays—takes place, researchers carefully select the plants for genotype—invisible genetic traits in the plant’s DNA. Dan Hansen, a DuPont Pioneer communications consultant, described the gene selection process as a ‘funnel’ that starts with many possibilities and then narrows the varieties down. To develop hybrids, Pioneer researchers took leaf punches from thousands of corn samples, extracted the DNA and searched for molecular markers—special combinations of amino acids—that indicated drought resistance. They hybridized, or crossed, different varieties and tested those. Only the best of the best genotypes make it out of the lab for field-testing. 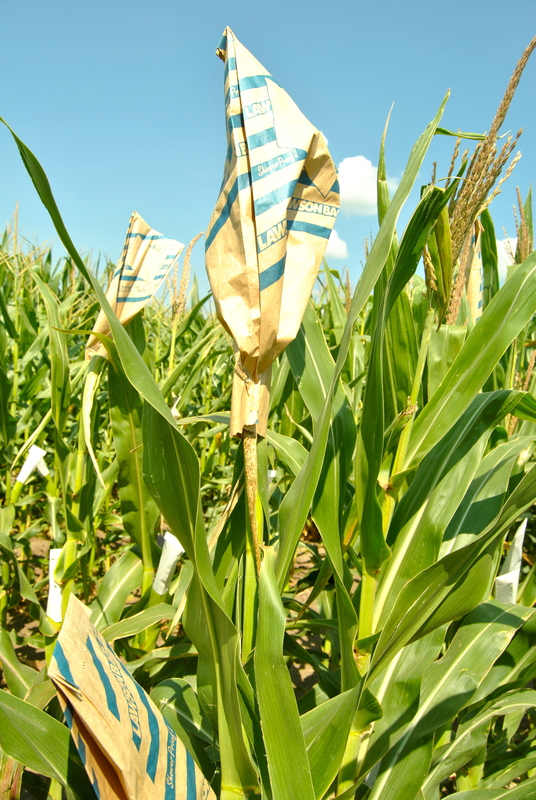 Paper bags are used to crossbreed different corn varieties by keeping the corn stalks from self-pollinating. Genotyping has been going on since the ’90s, but last year, DuPont Pioneer began using a proprietary robotics system to extract the genetic information from the leaves more quickly, without human error. The robot is the only one of its kind in the world, so we weren’t allowed to photograph it, but it looks a bit like a boxy refrigerator with Tyrannosaurus Rex arms. Though the research is extremely high-tech, this is all accomplished through native breeding and without adding transgenes—also called genetically modified organisms (or GMOs). Transgenes are genes taken from one organism (anything from a bacteria to a dandelion to a grizzly bear) and inserted into the genetic sequence of another (like corn) to add a specific, desirable characteristic (like drought resistance). By contrast, native breeding—the process used for AQUAmax—selects for those hybrid lines “with the natural ability to win the race,” as Hansen puts it. A transgene would be an extra, external push, like an expensive pair of track shoes. Monsanto has already laced on the fancy track shoes to create its new drought-tolerant corn seed product, Genuity DroughtGard Hybrids. 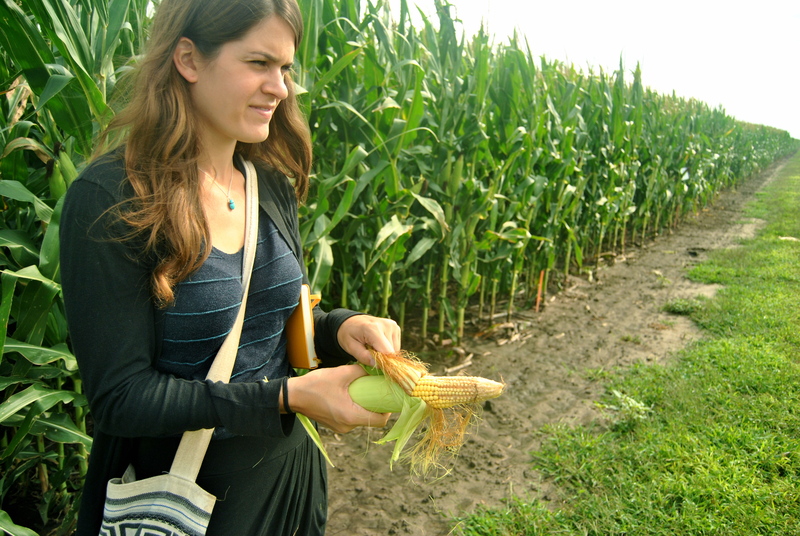 Developers inserted a drought-tolerant “cold-shock” gene from a bacteria, Bacillus subtilis, into the corn’s genome in an effort to minimize the corn plant’s defensive reaction to heat. Bacteria use the cold-shock gene to keep producing growth proteins when it’s cold, and the idea is that it works the same way in corn when it’s hot. The bacteria is ubiquitous—in fact, it’s probably on you right now. 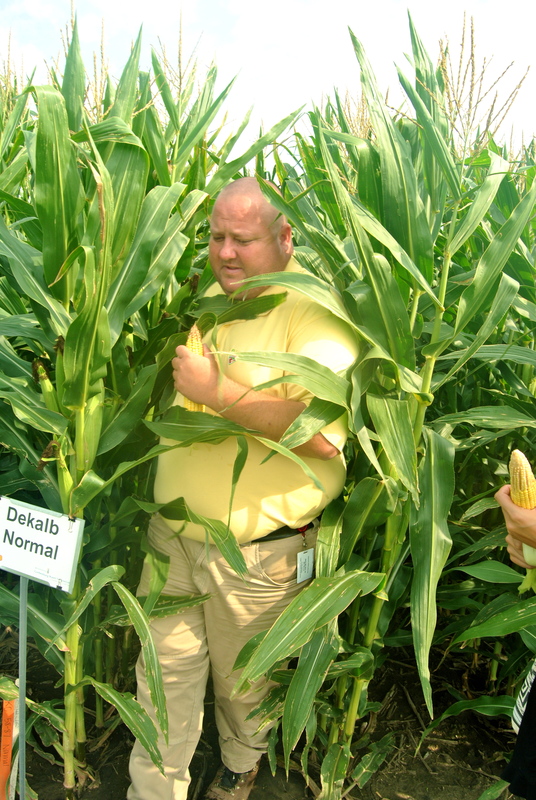 Chandler Mazour of Monsanto picks a good ear of corn from the research field. 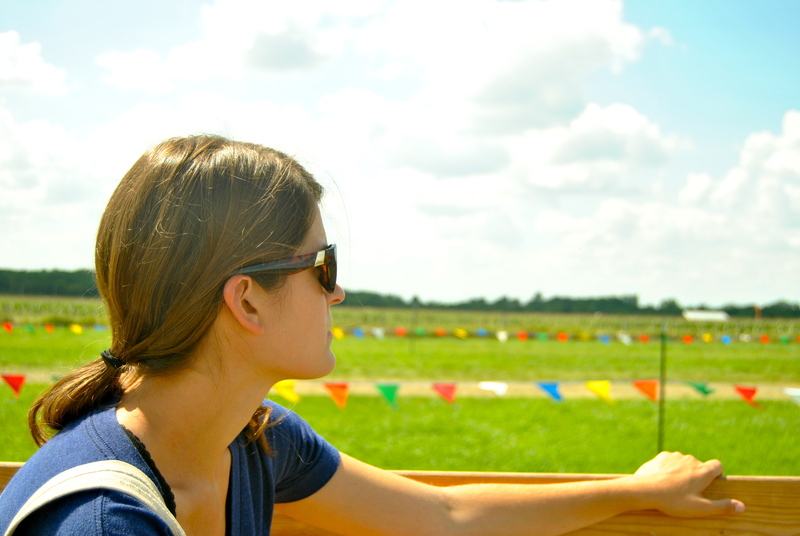 Mazour took us on a tour of the Center, which opened in 2009, encompassing 320 acres of experimental fields. 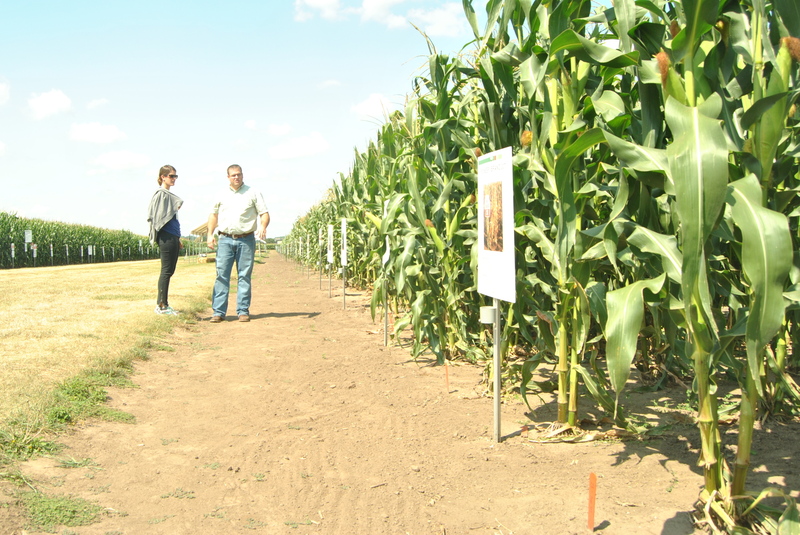 He leads their research initiatives, one of which is testing different varieties of corn, including DroughtGard Hybrids, under different levels of water stress. 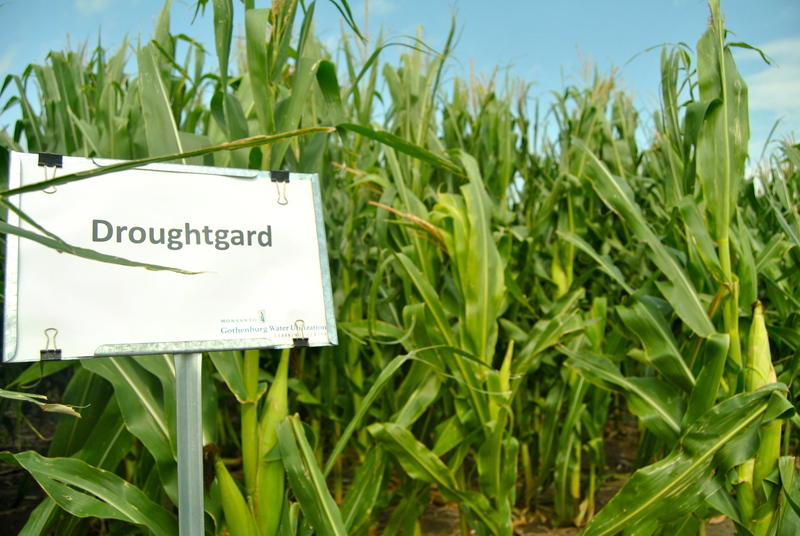 In the comparison tests between DroughtGard and other Monsanto varieties, the Center found that the drought-resistant plants produced equal or better yields than the best alternative, using 0.5 inches less water over the growing season. In 2012 the company enlisted over 200 large-scale farmers to test the product in their fields—focusing mainly on the dryland farmers in the Western part of Nebraska who don’t use irrigation water. 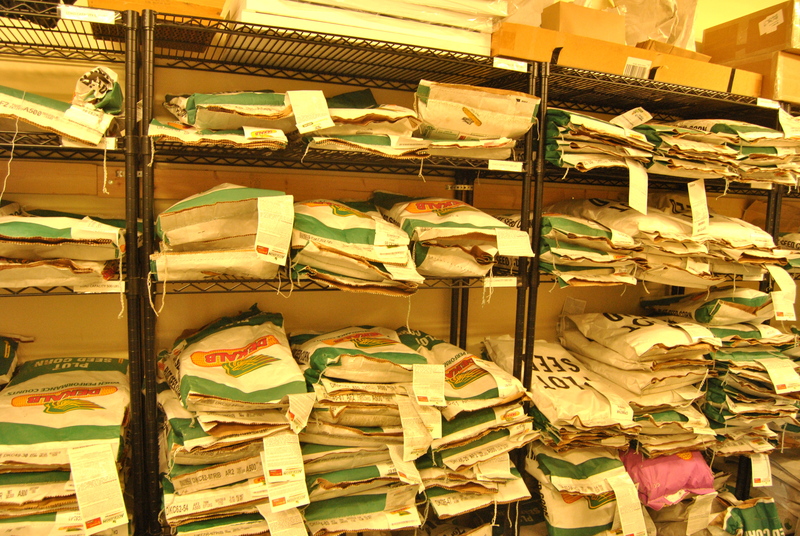 The seed storage room holds lots of different GMO corn varieties at Monsanto’s Water Utilization Learning Center. Mazour doesn’t know how many farmers are using DroughtGard this year. He said the feedback from the farmers who tested the product in 2012 was positive, but he stressed that there’s an educational component to growing drought-tolerant corn that will take some time. The corn grows marginally better than other varieties under heat stress, but it’s not a cactus. It still needs water. Still, keeping the corn alive for even just one more day can make a big difference if that’s the day the rains come. Not everyone is into the idea of creating corn with metaphorical track shoes. Most countries in the European Union have banned the cultivation of genetically modified crops, citing health concerns and uncertainty about the long-term effects. Though, many of these countries still import transgenic products from elsewhere. Following the DroughtGard launch, the Union of Concerned Scientists released a report arguing that the seed is ineffective. Other anti-GMO groups like the Non-GMO Project say that transgenic crops are simply unnecessary—that traditional hybridization breeding techniques are less risky and produce comparable rewards. Still, it’s hard to know what the potential benefits of further innovation in genetics could bring for the food system, especially in light of the expected climate vulnerabilities that threaten further harm to communities around the world already struggling to feed themselves. 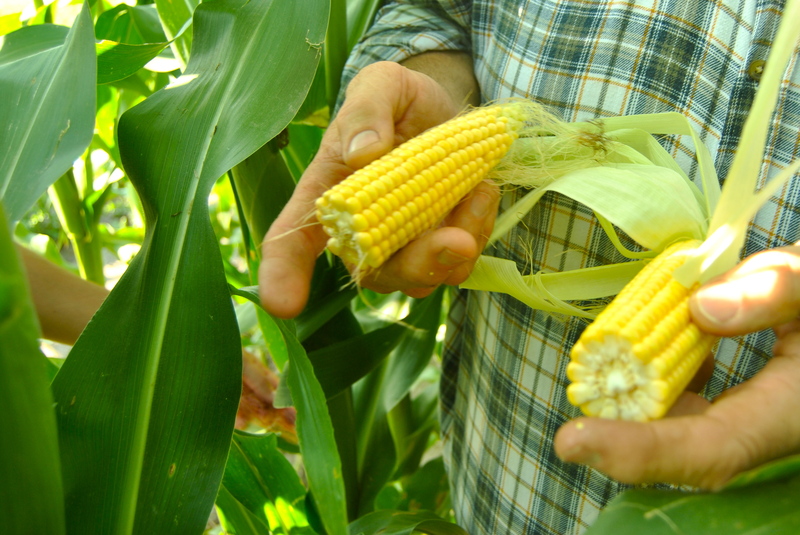 Pioneer developed the first line of AQUAmax without biotech traits, but they are examining adding them to the best corn hybrids–a process that takes an average of 13 years from the initial research stage to the point of regulatory approval. David Sieck, the Iowa corn grower, planted some fields with DuPont Pioneer’s AQUAmax this year. He recalls a time before the now commonly used transgenic corn varieties like Syngenta’s Bt corn. Back then, he sprayed more toxic chemicals onto his crops by hand to fight pests and disease, often returning from the fields coughing and nauseous. Now, with transgenes and better chemical sprays, he doesn’t worry as much about exposure to himself and his employees. Overall, Sieck’s feelings about transgenes are mixed, but he challenges us to come up with a better solution. David Sieck planted DuPont Pioneer’s Optimum AQUAmax corn this year. 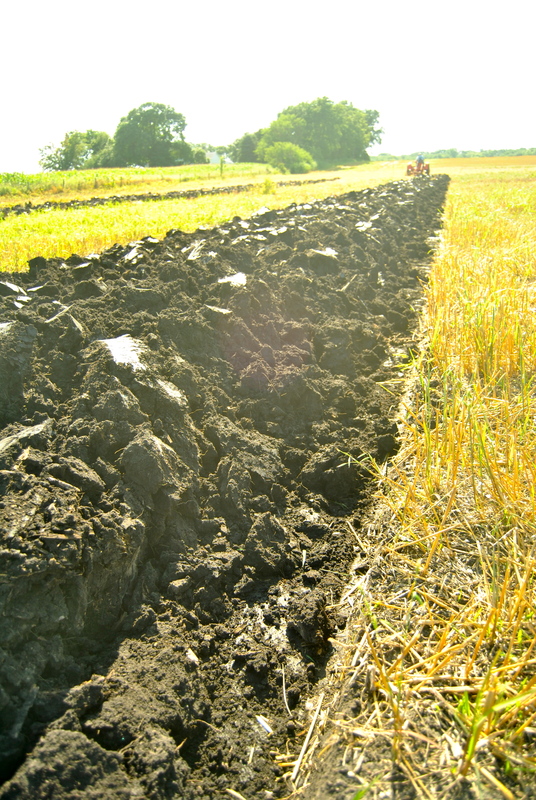 Tilling releases soil moisture and carbon emissions into the atmosphere. Sieck argues that dealing with drought actually has less to do with seeds, and more to do with soil quality. He points to advancements in cover crops, where farmers plant nitrogen-fixers like radishes over the winter, building soil nutrients and decreasing erosion. Intercropping, which involves planting rows of moisture-trapping crops like wheat in between the corn rows, is another technique farmers are starting to use. Finally, he mentions no-till farming, which keeps moisture in the soil. The irony of this hits us as we watch the competitive tillers gearing up for tomorrow’s competition in the Homestead Craft Show. Even Monsanto stresses the need for a “systems” approach to growing corn to help seed varieties like DroughtGard reach their full potential. Mazour says you need it all: the right growing conditions, the best hybrid you can get, and the biotech trait that gives the crop that advantage at the finish line. 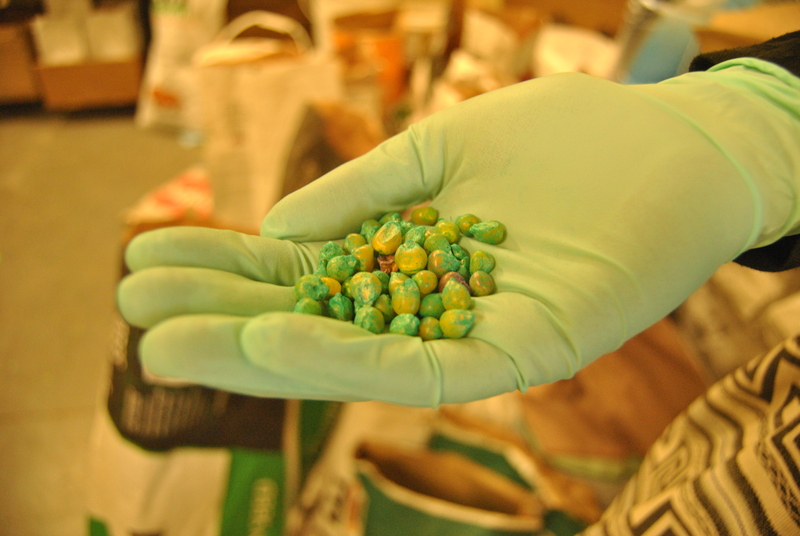 “The greatest point of genetic potential for a corn seed is when you put it in the ground. 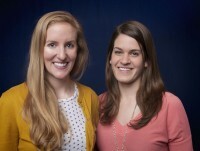 Everything else that happens afterwards just chips away at that yield,” Mazour said. View more photos of our travels in the Corn Belt.